If you are looking to expand your eCommerce business on Amazon or already selling on Amazon and need to enter new niches, there are two approaches to find the best selling products on Amazon in a niche. Before we discuss these approaches in detail we need to understand that the Amazon search volume of any niche is an important factor when choosing among most profitable Amazon niches. Of course, high search volume means the demand is high but remember it is also accompanied by high competition. You can find profitable products with Amazon niche product finder software, the systematic approach or manually using your own research skills which is an unsystematic approach. The goal is to generate product ideas that you can sell on Amazon to start or expand your business. Using the systematic approach you can quickly and easily generate a list of profitable products in several high Amazon search volume niches. To implement this approach and start finding most profitable Amazon niches you can use Amazon Niche Finder tool of AMZ Insight. What you need to do is simply create a list of product based keywords with high Amazon search volume. Go to the Niche Analyzer tool and put the keywords one by one in the search bar to get real-time data in a proper analytical form. 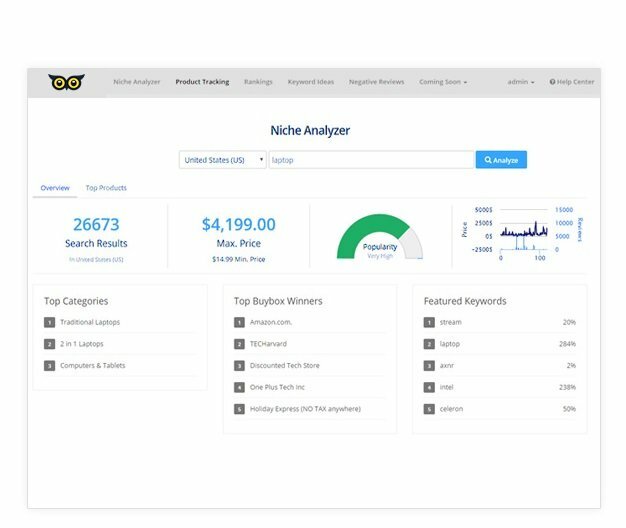 In the niche analyzer you will get several important stats related to that keyword including popularity, sellers count, price range and top products. While searching for the most profitable product, in top products tab you get estimated sales of the products, sales rank, reviews and buy box price etc. With the help of the provided statistics, you need to analyze whether your product is profitable enough to give you good business and can come in top 5 products of that niche or not. It is very easy to identify most profitable Amazon niches using this tool. Carefully observe all the figures, if sales volume is high and reviews count of some of the top product is less than 100 that means it`s easy to rank your product in top 5. You can shortlist the products from that niche and repeat the process to find more products. With the second approach, instead of using an Amazon product research tool you can go unsystematic way by using your own creative thinking and experience. You need to do some brainstorming to identify what would you like to sell and in which marketplace. Document everything you do, see, hear, touch and experience on a daily basis. Think about the things around you such as car, computer, office, clothing which interests you, it could be anything that you can find useful and start selling. Just make sure that whatever you sell, that should fulfill customers’ need. Now the basic question is, how much money you can make in that niche? To get an answer you need to type in the main keyword in the Amazon search bar check top 5 products in the search results. If the sales rank is less than 1500 that means this niche has high demand but sales rank won’t give you idea of estimated monthly sales of the top products which you can get using Amazon sales estimator. However, it can be cross verified by checking the search volume of the main keywords in Google Keywords Planner. If search volume is more than 10,000 searches per month then it definitely has a high demand. Now you can shortlist products from the niches that you found using manual approach. Either of these two can be effective in finding products, and have their own pros and cons. But, we recommend a systematic approach which is data-driven, traceable and can help you more effectively in getting better results with the help of a comprehensive analysis of the selected niches. Seems like you have found a way to find most profitable amazon niches and products product to sell on Amazon based on tracking the sales rank, reviews and search volume. Even if you already know the actual sales of the product and the niche before, you can check estimated sales volume in the Niche Analyzer feature to help you get more clear and in-depth insights. Lets not put your hard earned money on the stake by just finalizing the niches and products with high Amazon search volume only. Regardless of the fact that you have used Amazon niche product finder tool or the manual research approach, you are highly encouraged to track the products for quite a few days. When you have tracking data on hand for your selected products, you actually get to know the demand of those products, average pricing and the idea of competition. You will also see the activities of the sellers of those products, for example how often and by how much they change the pricing, what and when they offer and what impact it shows on the BSR and the sales of the products. It all doesn’t end here, to know the profitability of any product you need to run it through the Amazon FBA calculator. This tool will help you understand all the fees and costs that you might incur while selling on Amazon. You will get the idea of net profit and the profit margin of the product with the help of this Amazon tool. To give you a head start on your research for most profitable Amazon niches and products, AMZ Insight offers 10-Days free trial to all new users. Its a plenty of time to find products with the built-in Amazon niche product finder tool. You will also be able to get sufficient tracking data to fully understand the competition, selling and profitability potential.